Sorry to be late publishing this canvas print – the eleventh in the series, which should have been posted on November 30th, but the problems I’m having at present with my laptop prevented me posting anything! This was a dinghy I found in the harbour at St Ives in Cornwall when I was there last year. I loved the colour of the reflections and the contrast between wall the lovely turquoise-y blues and the warm browns, with those shots of yellow!All the details are exactly the same as for the other canvas prints – there is a limited edition of six copies, and one has actually already sold, so only five available. I’m hoping to get my laptop problems solved very soon, so I shall be back posting regularly in a day or two I hope! 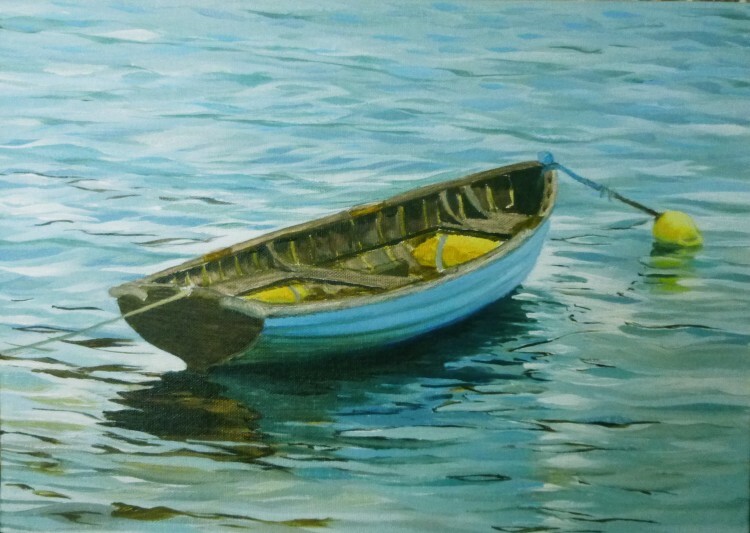 In the meantime I’m working hard on my next Peddars Way painting, and have just started another dinghy!